The superb kitchen/dining room offers plenty of space for entertaining and the large sitting room has a log burning stove with the study providing a quiet space for those 'work from home' days. The French doors from both the dining area and sitting room not only allow plenty of sunshine to flood in but also provide easy access to the garden and alfresco dining. The master bedroom has built-in wardrobes and fabulous ensuite with the two remaining double bedrooms being well served by the three piece, modern bathroom. 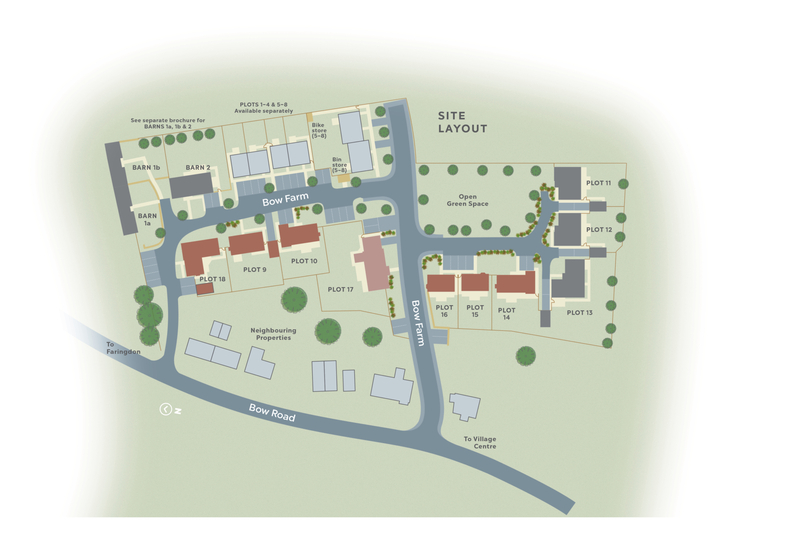 To register your interest in The Ardington, Plot 14 and/or to arrange a viewing, click the button below and fill out the form. 3840mm x 3640mm 12'7" x 11'11"
5640mm x 3440mm 18'6" x 11'3"
2990mm x 1840mm 9'10" x 6'0"
2800mm x 1785mm 9'2" x 5'10"
5640mm x 3475mm 18'6" x 11'5"
3885mm x 2625mm 12'9" x 8'7"
3070mm x 2915mm 10'1" x 9'7"
3020mm x 1445mm 9'11" x 4'9"
2445mm x 1905mm 8'0" x 6'3"
The Ardington, Plot 14 is part of the Bow Farm development. For more information click the button below.